How can I add length to my taffeta wedding dress? I ordered my dress online from lilywedding.com and I absolutely LOVE the style. The dress fits almost perfect except that it's about 3 inches too short. The designers will not exchange the dress since it is "custom sized", therefore I am in desperate need of suggestions as to how I may add the 3" in length I need. Any/All suggestions, ideas, and photos would be helpful and greatly appreciated. 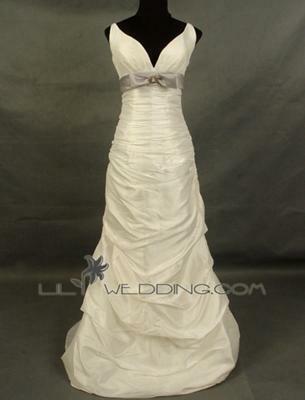 I have a couple of ideas I can give you in order to lengthen the hem on your wedding dress. But I must say it will be best to take your gown to a wedding dress alterations specialist for this type of adjustment, unless you are very advanced in your sewing skills. The first thing you might try is to let down some of the pick ups in the dress. You would do this by taking out a few of the places near the bottom hem that is tacked up to form the tufts. When some of these are let down you might get enough to lengthen your dress the amount you need. Another way would be to add a layer of fabric all the way around that is has a balloon hem appearance. You would attach this to the lining of the gown. This will not be easy because you would need to have some pattern making skills. The other problem with this is that you would have to match the fabric in order to pull this off. Again, this is not something you should attempt unless you have advanced skills in sewing. A sewing professional will let you know if any of the ideas I have mentioned will work with your dress. Seeing the gown in person can tell more than I can from the picture. Also they may come up with some other ideas. I wish you well with finding a solution to this problem. Let us know what you come up with! Comments for My lilywedding.com Wedding Dress Is Too Short! Your suggestion to let down the pick ups on my dress helped with the length and it still looks true to the original style. Your help is greatly appreciated.